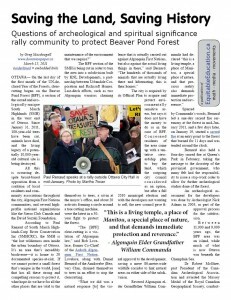 This is the print version of an article I wrote for The Dominion on the Beaver Pond Forest / South March Highlands. It is a 2-pg PDF file, which is designed for printing double-sided onto a single piece of paper (and making copies and distributing). But it is also good for reading online (there are embedded links) or printing single-sided to read away from the computer. Click here or on the image to download the article PDF. OTTAWA—On the last day of the first month of the UN-declared Year of the Forests, clear-cutting began on the Beaver Pond Forest (BPF), a section of the sacred and ecologically-unique South March Highlands (SMH) in the west end of Ottawa. Since January 31, 2011, 100-year-old trees have been cut, animals have died, and the living legacy of a potentially 10,000-year-old cultural site is being destroyed. All this is occurring despite broad-based opposition from a coalition of local residents and community associations throughout the city, Algonquin First Nations communities, and several high-profile national organizations like the Sierra Club Canada and the David Suzuki Foundation. The BPF section of the SMH is being cut in order to turn the area into a subdivision built by KNL Developments, a partnership between Urbandale Corporation and Richcraft Homes. Last-ditch efforts, such as two Algonquin warriors chaining themselves to trees, a sit-in at the mayor’s office, and about 20 activists forming a circle around a tree cutting machine, were the latest in a 30-year fight to protect the forest. “The [BPF] clear-cutting is a violation of Algonquin law,” said Bob Lovelace, former Co-Chief of the Ardoch Algonquin First Nation. Lovelace, along with Daniel Bernard of the Amikwabe (Beaver) Clan, chained themselves to trees in an effort to stop the clearcutting. The city is required by its Official Plan to acquire and protect environmentally sensitive areas, but says it does not have the money to do so in the case of BPF. Concerned residents of the area came up with a tentative stewardship plan to buy the land, which the outgoing city council considered as an option, but after a fall 2010 municipal election and with the developers not wanting to sell, the new council gave final approval to the development, saving a mere 80-metre-wide wildlife corridor to link natural areas on either side of the subdivision. Spurred by Commanda’s words, Bernard led a one-day sacred fire ceremony at the forest in mid-January 2011, and a few days later, on January 19, he started a sacred fire at an entry point to the forest, a fire that burned for 11 days and was tended around the clock. Bernard also held a four-day sacred fire at Queen’s Park in February, taking the message to the doorstep of the provincial government, who many felt had the responsibility to issue a stop-work order to allow for further archeological studies of the forest. An archeological assessment for the developers was done by archeologist Nick Adams in 2003, as part of the approval process for the subdivision. Between 11,000 and 9,000 years ago, the BPF area was an island, while much of what is now Ottawa was beneath the Champlain Sea. Dr Robert McGhee, past President of the Canadian Archeological Association and recipient of the Massey Medal of the Royal Canadian Geographical Society, conducted a review of Adams’s assessment in 2010 and found what he termed a “fatal flaw”: in his study, Adams had dismissed any potential for historical, pre-European-contact archeology on the site. Another review, led by a prominent local archeologist Dr Marcel Laliberte, echoed McGhee’s concern and called for further study to be done in the area. The city and province both have legal processes to stop the cutting and order more studies, but neither has acted on any of the post-2004 information, and each states that it is up to the other level of government. The most recent archeological development is a February 13, 2011, paper from American historian/archeoastronomer William Sullivan, who judges a very high probability that the SMH could be a World Heritage Site, based on its characteristics and an analysis of a circle of stones found in the forest in 2010. Ottawa is situated on the Kitchissippi (Ottawa) River, which starts over 1,000 kilometres northwest of the city and serves as the Ontario/Quebec provincial border as it flows down to the St Lawrence River. The lower part of the river’s watershed is recognized by many as the unceded and unsurrendered traditional territory of the Algonquin. The “Algonquins of Ontario” (AOO), who are participating in a land claims process, do not represent all Algonquins in Ontario. Five eastern Ontario Algonquin First Nations not part of AOO sent letters to the government, asserting their own right to consultation, but they were ignored. Even Commanda’s letters to the city and province were only met with generic responses, despite his key position among the Algonquin people and the fact that he was awarded the Key to the City of Ottawa in 2006. The fact that Aboriginal and non-Aboriginal communities are uniting over the protection of BPF makes it similar to other instances of resistance to development projects in eastern and southern Ontario over the past few years. This includes protests against a highway through the Red Hill Valley in Hamilton; a dump (Site 41) in Simcoe County, north of Toronto, that threatened the underground water supply; a business park development in Hanlon Creek, Guelph; and uranium exploration in Robertsville, about an hour east of Ottawa. Shared characteristics of these battles include efforts over many years at dialogue with government (without much success), followed by direct actions in a final effort to stop imminent environmental destruction. For more information on the efforts to save the South March Highlands, please see www.ottawasgreatforest.com, www.southmarchhighlands.ca, and www.union-algonquin-union.com.